SUV-150B at Summit, Greenland.The SUV-150B spectroradiometer is no longer available for purchase. However, the SUV-150B that was installed at Summit until August 2017 (see below) is potentially available for deployment at a different site. Please contact BSI if you are interested. The SUV-150B is a newly developed scanning spectroradiometer, designed and built by Biospherical Instruments. It measures global spectral irradiance between 280 and 600 nm, and the spectral resolution is 0.63 nm. 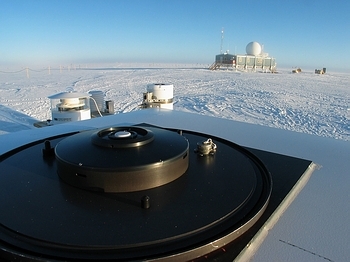 The instrument is fully automated and weatherproofed for use in extreme conditions. One instrument is currently deployed at Summit, Greenland as part of the National Science Foundation's Arctic Observing Network. The entrance optics of the SUV-150B consist of a Teflon diffuser covering the entrance port of a baffled integrating sphere. The sphere’s exit port is coupled with fiber optics to a scanning 150 mm f/4.4 Czerny Turner double monochromator. The two gratings of the monochromator are independently positioned by micro-stepping motors. High-resolution optical encoders provide active-feedback motor position control. The monochromator’s exit port is coupled to a bialkali PMT. All parts of the instrument are temperature stabilized to within ±1°C by a thermoelectric heater/cooler. A mercury lamp and a tungsten-halogen lamp are integral to the system and are used for daily wavelength and responsivity checks. Equipment for periodic absolute calibrations is also part of the system.